The draconian decision of the Broadcasting Commission of Jamaica (BCJ) to proscribe the broadcast of ‘daggering music’, subsequently extended to soca and other sexually explicit music or lyrics, dangles like the sword of Damocles over Jamaica’s cultural landscape. The General Managers of local TV stations are reacting with such hysteria that a recent episode of TVJ’s Entertainment Report had the titles of three of the songs on its top 10 listing crossed out with a large red sign simply saying CENSORED. Others are losing sleep over the money that will be lost from not being able to televise the gyrations of well-fed upper saint andrew-ites during the fast-approaching Jamaica carnival. Accordingly the BCJ is now calling on companies that are major advertisers to get involved in the process of cleaning up the airwaves. This is a welcome move indeed. Hopefully the BCJ will be just as uncompromising in its stand against payola as it has been in relation to ”indecent” lyrics. While we’re on the subject of of payola it’s worth noting the creativity with which some music producers are approaching this widespread scourge. Take the new singer Terry Lynn whom this blog has featured more than once. The Terry Lynn story is an inspiring one that points to the new and innovative directions Jamaican music might take. Zurich-based Russell ‘phred’ Hergert, Terry Lynn’s creative partner, is head of phree music, a label that is committed to the free online distribution of music. Flying in the face of traditional concerns about copyright protection as a way to earn money Hergert’s philosophy is one of expanding his singer’s fan base by ‘freeing’ up the music (This is also Matisyahu‘s approach—the Jewish Reggae singer makes tracks and live concerts available free to online fans). “Refusing to dole out the payola ransom money that Jamaican media and radio so often demands, 1000 copies of Terry Lynn’s debut album Kingstonlogic 2.0 were instead manufactured and distributed for free across the country, and throughout impoverished neighborhoods. Each copy was emblazoned with an anti-payola message; “my music is about the people, for the people, it’s about change. we will not pay media a ransom to play this for people, we are instead paying for phree copies for you”. 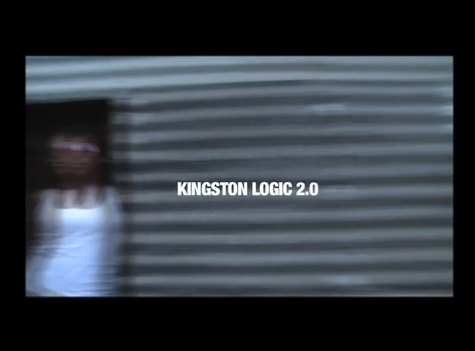 Kingstonlogic 2.0 / Directors Cut from Rickards Bros. on Vimeo. It relied heavily on the vibrancy of Kingston, its spontaneous daily occurrences and its inhabitants as opposed to any metaphor or even a storyboard. Since the song mentions so many things, we decided that the city would have to tell its own story. Consequently, we started to drive around looking for material that contained a good mixture of photographic form, excitement and of course relevance to Lynn’s lyrics. Before long we narrowed our shooting zone down to Terry’s community of Waterhouse after realizing that the city itself was far too large and difficult to capture by driving, stopping, and driving again. At that point we decided to immerse ourselves in the community for as long as it took to attain the footage that we needed. This proved to be a good decision even though the images still had to present themselves to us as we walked and searched. It was very much a documentary-style exercise that took a total of 6 days on foot. Terry Lynn is a unique artist. She captures with her words an honest depiction of Kingston’s environment and Jamaica’s struggles the way a camera captures images with a lens. Terry lives in (read: ‘born in’ – her mother couldn’t get to a hospital at the time) Waterhouse, Kingston JA. A brutally impoverished area of inner-city Kingston, where living by your word is often a life or death decision. Terry’s writing pulls at the root of the issues she addresses with vivid clarity, on her own sonic terms. She isn’t getting paid much to make her music, other than living expenses and creative costs to record, mix, master etc. She wants to get her message out independently and free from the local music industry’s repetitive sound and myopic business model. We’ve partnered because we think our collective skills might benefit the other. My writing opened up under the freedom to express myself and my environment away from time restraints and local misconceptions. We’d work on songs, travel to record and re-record, re-work structures, free to discard what didn’t feel right. He’d always surprise me with new producers, new beats, ideas and we’d just keep carving till it felt done, ready. We agreed to release nothing until we had a complete set of work. That was how we wanted it. Already Lynn has been hailed by mainstream media in London and New York as one of the top 10 acts to listen out for in 2009 (“the new sound of the Jamaican underground is fierce, and its female”–Time Out, London). Local businesspeople should take a leaf out of Hergert’s innovative model of artiste development and start investing in the abundant raw, young talent seething in Kingston (The last time someone did this–Chris Blackwell–the product was a Bob Marley). Only yesterday music producer Mikie Bennett wondered aloud on Facebook what the music industry could have been like had it received the kind of investment cricket has received. The new non-commercial models of music dissemination–open source music sharing for instance, are poised to transform the consumption of music. The best way to improve the local musical product is for the kind of investment to take place that other sectors such as tourism and sport have benefited from. Perhaps then there would be no need for the BCJ to intervene in local music production and distribution in the way it has. Brawta: check out this video of a song by Sanjay and Dazzla about what they would do if they had Bill Gates’ money. The Broadcasting Omission seems, as they say in these parts, a day late and a dollar short. Previous Previous post: Indiaspotting … Jai ho Slumdog!